, were celebrated painters of the Lombard school, all of Bologna, in Italy, and the founders of the Bologna school. Lewis Caracci was born in 1555, and was cousin-german to Augustine and Hannibal, who were brothers. He discovered but a.n indifferent genius for painting under his first master, Prospero Fontana who therefore dissuaded him from | pursuing it any farther, and treated him so roughly that Lewis left his school. However, he was determined to supply the defects of nature by art; and henceforward had recourse to no other master but the works of the great painters. He went to Venice, where the famous Tintoret, seeing something of his doing, encouraged him to proceed iii his profession, and foretold, that he would one day be the first in it. This prophetic applause animated him in his resolutions to acquire a mastery an his art; and he travelled about to study the works of those who had excelled in it. He studied Titian’s, Tintoret’s, and Paulo Veronese’s works at Venice; Andrea del Sarto’s at Florence; Correggio’s at Parma; and Julio Romano’s at Mantua: but Correggio’s manner touched him most sensibly, and he followed it ever after. Augustine Caracci was born in 1557, and Hannibal in 1560. Their father, though a taylor in trade, was yet very careful to give his sons a liberal education. Augustine was intended to be bred a scholar; but his genius leading him to arts, he was afterwards put to a goldsmith. He quitted this profession in a little time, and then gave himself up to every thing that pleased his fancy. He first put himself under the tuition of his cousin Lewis; and became a very good designer and painter. He gained some knowledge likewise of all the parts of the mathematics, natural philosophy, rhetoric, music, and most of the liberal arts and sciences. He was also a tolerable poet, and very accomplished in many other respects. Though painting was the profession he always adhered to, yet it was often interrupted by his pursuits in the art of engraving, which he learnt of Cornelius Cort, and in which he surpassed all the masters of his time. 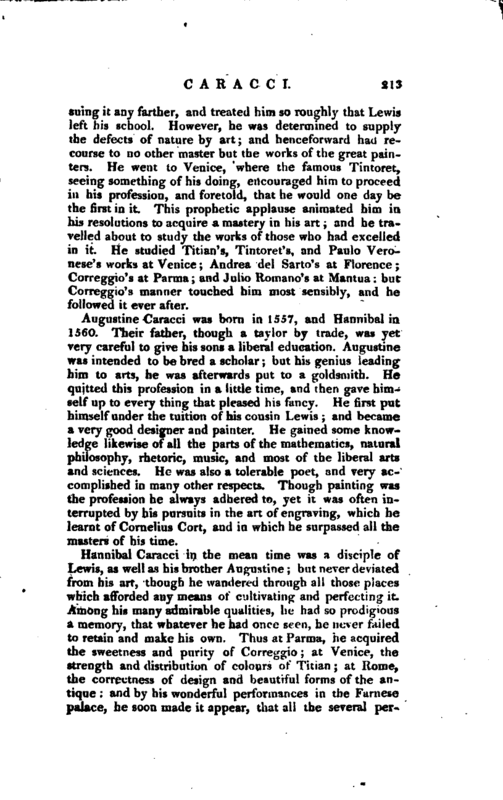 Hannibal Caracci in the mean time was a disciple of Lewis, as well as his brother Augustine; but never deviated from his art, though he wandered through all those places which afforded any means of cultivating and perfecting it. Among his many admirable qualities, he had so prodigious a memory, that whatever he had once seen, he never failed to retain and make his own. Thus at Parma, he acquired the sweetness and purity of Correggio; at Venice, the strength and distribution of colours of Titian; at Rome, the correctness of design and beautiful forms of the antique: and by his wonderful performances in the Farnese palace, he soon made it appear, that all the several | perfections of the most eminent masters, his predecessors, were united in himself alone. At length these three painters, having made all the advantages they could by observation and practice, formed a plan of association, and continued henceforward almost always together. Lewis communicated his discoveries freely to his cousins; and proposed to them that they should unite their sentiments and their manner, and act as it were in confederacy. 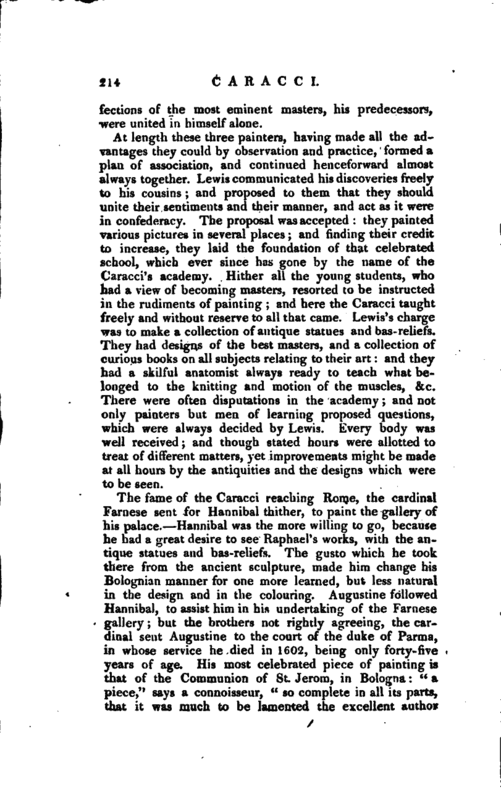 The proposal was accepted: they painted various pictures in several places; and finding their credit to increase, they laid the foundation of that celebrated school, which ever since has gone by the name of the Caracci’s academy. Hither all the young students, who had a view of becoming masters, resorted to be instructed in the rudiments of painting; and here the Caracci taught freely and without reserve to all that came. Lewis’s charge was to make a collection of antique statues and bas-reliefs. They had designs of the best masters, and a collection of curious books on all subjects relating to their art: and they had a skilful anatomist always ready to teach what belonged to the knitting and motion of the muscles, &c. There were often disputations in the academy; and not only painters but men of learning proposed questions, which were always decided by Lewis. Every body was well received; and though stated hours were allotted to treat of different matters, yet improvements might be made at all hours by the antiquities and the designs which were to be seen. The fame of the Caracci reaching Rome, the cardinal Farnese sent for Hannibal thither, to paint the gallery of his palace. 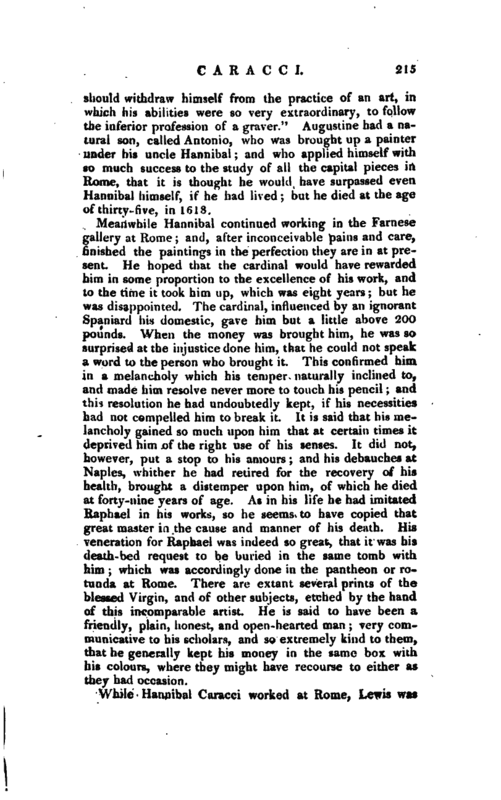 Hannibal was the more willing to go, because he had a great desire to see Raphael’s works, with the antique statues and bas-reliefs. The gusto which he took there from the ancient sculpture, made him change his Bolognian manner for one more learned, but less natural in the design and in the colouring. Augustine followed Hannibal, to assist him in his undertaking of the Farnese gallery; but the brothers not rightly agreeing, the cardinal sent Augustine to the court of the duke of Parma, in whose service he died in 1602, being only forty-five years of age. His most celebrated piece of painting is that of the Communion of St. Jerom, in Bologna: “a piece,” says a connoisseur, “so complete in all its parts, that it was much to be lamented the excellent author | should withdraw himself from the practice of an art, in which his abilities were so very extraordinary, to follow the inferior profession of a graver.” Augustine had a natural son, called Antonio, who was brought up a painter under his uncle Hannibal; and who applied himself with so much success to the study of all the capital pieces in Home, that it is thought he would have surpassed even Hannibal himself, if he had lived hut he died at the age of thirty- five, in 1618. Meanwhile Hannibal continued working in the Farnese gallery at Rome; and, after inconceivable pains and care, finished the paintings in the perfection they are in at present. He hoped that the cardinal would have rewarded him in some proportion to the excellence of his work, and to the time it took him up, which was eight years; but he was disappointed. The cardinal, influenced by an ignorant Spaniard his domestic, gave him but a little above 200 pounds. When the money was brought him, he was so surprised at the injustice done him, that he could not speak a word to the person who brought it. This confirmed him in a melancholy which his temper naturally inclined to, and made him resolve never more to touch his pencil; and this resolution he had undoubtedly kept, if his necessities had not compelled him to break it. It is said that his melancholy gained so much upon him that at certain times it deprived him of the right use of his senses. It did not, however, put a stop to his amours; and his debauches at Naples, whither he had retired for the recovery of his health, brought a distemper upon him, of which he died at forty-nine years of age. As in his life he had imitated Raphael in his works, so he seems to have copied that great master in the cause and manner of his death. His veneration for Raphael was indeed so great, that it was his death- bed request to be buried in the same tomb with him which was accordingly done in the pantheon or rotunda at Rome. There are extant several prints of the blessed Virgin, and of other subjects, etched by the hand of this incomparable artist. He is said to have been a friendly, plain, honest, and open-hearted man; very com^ municative to his scholars, and so extremely kind to them, that he generally kept his money in the same box with his colours, where they might have recourse to either as they had occasion. 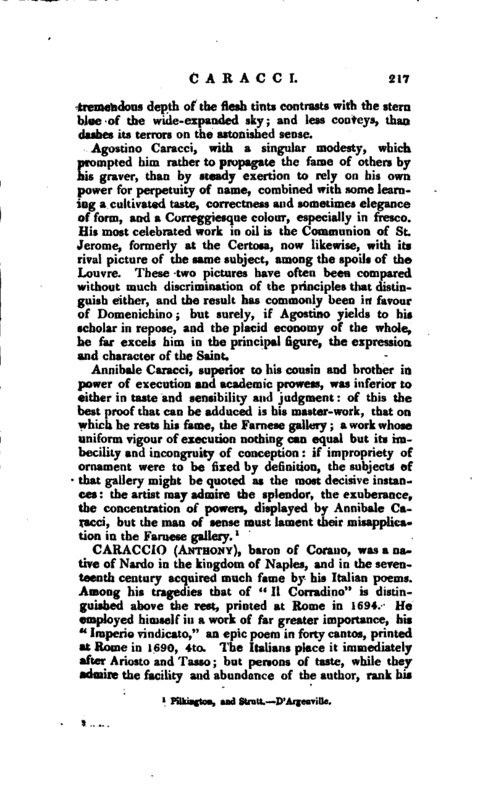 While Hannibal Caracci worked at Home, Lewis was | courted from all parts of Lombardy, especially by the clergy, to make pictures in their churches; and we may judge of his capacity and facility, by the great number of pictures he made, and by the preference that was given him to other painters. In the midst of these employments, Hannibal solicited him to come and assist him in the Farnese gallery; and so earnestly that he could not avoid complying with his request. 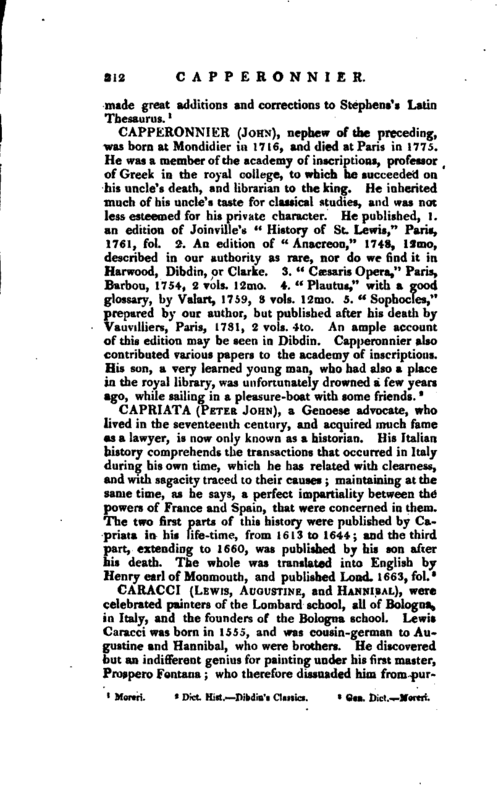 He w r ent to Rome; corrected several things in that gallery; painted a figure or two himself, and then returned to Bologna, where he died, 1619, aged 63. 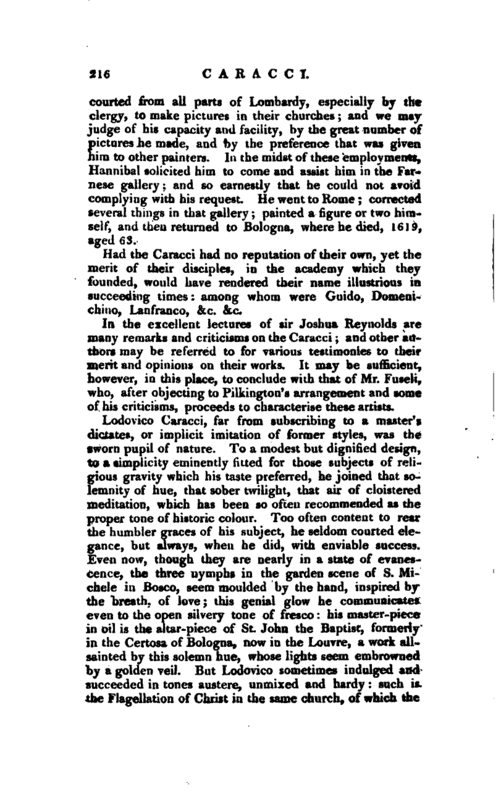 Had the Caracci had no reputation of their own, yet the merit of their disciples, in the academy which they founded, would have rendered their name illustrious in succeeding times: among whom were Guido, Domenichino, Lanfranco, &c. &c.
In the excellent lectures of sir Joshua Reynolds are many remarks and criticisms on the Caracci and other authors may be referred to forvarious testimonies to their merit and opinions on their works. It may be sufficient, however, in this place, to conclude with that of Mr. Fuseli, 'who, after objecting to Pilkington’s arrangement and some of his criticisms, proceeds to characterise these artists. Lodovico Caracci, far from subscribing to a master’s dictates, or implicit imitation of former styles, was the sworn pnipil of nature. To a modest but dignified design, to a simplicity eminently fitted for those subjects of religious gravity which his taste preferred, he joined that solemnity of hue, that sober twjlight, that air of cloistered meditation, which has been so often recommended as the proper tone of historic colour. Too often content to rear the humbler graces of his subject, he seldom courted elegance, but always, when he did, with enviable success. Even now, though they are nearly -n a state of evanescence, the three nymphs in the garden scene of S. Michele in Bosco, seem moulded by the hand, inspired by the breath, of love; this genial glow he communicates even to the open silvery tone of fresco: his master-piece in oil is the altar-piece of St. John the Baptist, formerly in the Certosa of Bologna, now in the Louvre, a work allsainted by this solemn hue, whose lights seem embrowned by a golden veil. But Lodovico sometimes indulged and succeeded in tones austere, unmixed and hardy: such is the Flagellation, of Christ in the same church, of which the | tremendous depth of the flesh tints contrasts with therstern blue of the wide-expanded sky; and less conveys, than dashes its terrors on the astonished sense. Agostino Caracci, with a singular modesty, which prompted him rather to propagate the fame of others by his graver, than by steady exertion to rely on his own power for perpetuity of name, combined with some learning a cultivated taste, correctness and sometimes elegance of form, and a Correggiesque colour, especially in fresco. His most celebrated work in oil is the Communion of St. Jerome, formerly at the Certosa, now likewise, with its rival picture of the same subject, among the spoils of the Louvre. These two pictures have often been compared without much discrimination of the principles that distinguish either, and the result has commonly been in favour of Domenichino; but surely, if Agostino yields to his scholar in repose, and the placid economy of the whole, he far excels him in the principal figure, the expression and character of the Saint.